In this concept piece, the Employment Security Department of Washington is seeking to develop a mobile application for eligible residents to file for their benefits. The focus of our scope: develop a streamlined iOS application for users to file their weekly unemployment claims. Our team was provided with a one-page design prompt to create a mobile application based off the current process, available on desktop. The department is aware of usability issues with the current desktop site and would eventually like to use the new streamlined mobile application to inform the redesign of the desktop site. To gain a better understand of the filing process, I reviewed the current system available on desktop. As the system is only available to current filers of unemployment claims, I observed a volunteer as they worked through the process. To better understand the experience of filing for unemployment, we sent out a screen survey using Survey Monkey. Our survey produced 12 responses. We followed up with 8 in-person interviews. Just because a site is government funded does not mean it cannot be consumer grade. In seeking a good example of this, I examined TurboTax, specifically focusing on how it guides users through a convoluted government process in a user friendly, digestable way. 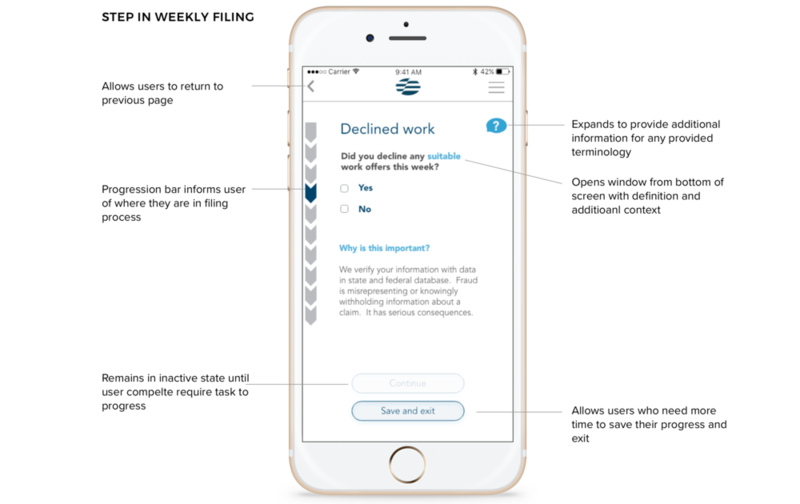 Create a mobile platform for eligible users to file their weekly claims. The tone and diction of the app will be simple, clear, and respectful, giving the user confidence that it’s been done correctly and completely. Additionally, users will be able to file their job searches throughout the week at their convenience, and keep track of their weekly claims from their mobile devices. To add flexibility and convince to the filing process, a job log capability was added. This allows users to log their job searches as they go, on their own time. This log will then be pre-populated into their weekly claim to confirm before submitting their filing. To qualify for weekly benefits, users must complete a series of questions each week. While many of these questions could change on a weekly basis, we determined that 6 of these questions were unlikely to change and could be placed on one page, with the previous week's answers pre-populated for user to review and make changes if needed.